Dental bonding is an extremely versatile and effective procedure for treating a wide range of conditions. Learn more about this revolutionary procedure and see if it’s ideal for your smile. Dental bonding is one of the fastest and most pain-free methods for correcting minor dental issues such as chips, cracks, and stains, strengthening teeth while creating beautiful aesthetic results and a brilliant smile. The treatment is extremely conservative of natural tooth structure, and it can even be used to reshape teeth that are misaligned or overly small. In the dental bonding procedure, a preparatory solution is first applied to the teeth in order to allow the bonding to adhere firmly. Dr. Rudner then carefully applies and shapes the bonding material to create the desired effect. Once the bonding material has been sculpted into its final shape, a high-intensity light is used to quickly harden the bonding material, which is then buffed and polished to create a lustrous, attractive finish. The composite bonding material is color-matched to the shade of each patient’s natural teeth, so repairs blend indistinguishably into the patient’s smile while concealing imperfections and restoring discolored teeth to a healthy, white appearance. Each dental bonding treatment performed at our Beverly Hills office is usually finished in less than an hour with immediately visible results, although depending on the extent and severity of your dental issues more than one treatment may be required to restore your smile. Dental bonding treatment is a splendid alternative to more extensive cosmetic dentistry procedures such as those required for the installation of porcelain veneers or dental crowns and bridges, allowing us to create striking results more affordably. Furthermore, many insurance carriers cover dental bonding, especially when a tooth requires structural repair. 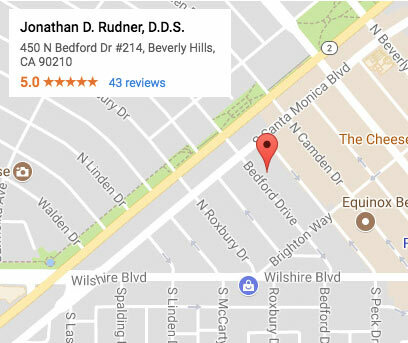 Schedule a Consultation with Jonathan Rudner, D.D.S. To find out whether you are a candidate for cosmetic dental treatment with tooth-colored fillings, dental bonding, or Invisalign® transparent orthodontic aligners, contact our Beverly Hills and Santa Monica area center to schedule a consultation with cosmetic dentist Jonathan Rudner. Dr. Rudner will be happy to meet with you and work out a customized individual treatment plan designed to give you the smile you’ve been wanting.